This is my favoured way of getting articulated harmonics - it works equally well with a pick or just fingers. You shouldn't have to contort your hand to do this - my hand is more or less in the natural position I adopt when picking. I realise that we all may have different shape/size hands so you may have to adapt this technique to suit your normal picking style - maybe using a different finger or the heel of your hand to touch the string. You will also have to establish for yourself the location for the guide point - In my case the distance between the pick and where my little finger touches the string is 4 frets so I'm following an F pentatonic box at fret 13 with my pick - my little finger then is automatically at the right place ( fret 17 ) to get the harmonic an octave above the fretted note ( fret 5 ). Every move up or down the string with your left hand must be mirrored by your right hand i.e. if your left hand finger moves up the fret board by 2 frets then your right hand also picks 2 frets higher. This " following the left hand " method is how I play the harmonics in the piece at the end of the video. There are a lot of chromatic notes so I just locate the first harmonic and then follow my left hand as it goes up and down the fingerboard. I have tabbed this out for reference but I suggest you try this technique on something you are familiar with . 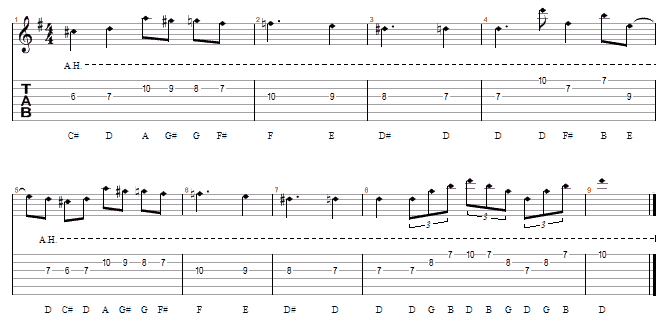 All harmonics in this lesson are one octave above the fretted note.